NOTE: It has come to the translator's attention that the textual content of some of the original articles sent or posted by Ms Brummund from/in Germany have been altered after the translator received the text translated below. The following text is a translation of the content of the article as it appeared on the date indicated at the end of this translated text, and does not include translation of any alterations that may have been made in the German original since that date. In the summer of 1983 the Swiss astrologer-couple Bruno & Louise Huber presented a Seminar in Hamburg in which members of the Hamburg School board of directors participated. In addition to previously recognized methods, Bruno Huber presented us with his new developments in work with the Amphora, where he grouped the planets according to a seemingly enigmatic system: at the bottom one found Saturn as indicator of the basis or original source, corresponding to the Mother. The other planets were then built up from that point. This all seemed quite curious to me, and it stimulated me to further reflection. I asked myself if it would also be possible to include depth psychology as a component of the Witte System. We work with 22 factors including 10 planets, 8 transneptunians, and the 4 reference points. Energies emanate only from the rotating bodies. The reference points emit no energies, since they are calculated mathematical points in space referenced from 0° Aries; yet, consideration of their relationships to all other factors is indispensable in interpretation. If we set aside the reference points (Aries Point, the MC, the Ascendant, and the Lunar Node), we have 18 factors, consisting of the 10 planets and 8 transneptunians. If each planet is paired with a transneptunian, there are 2 planets left over. Which are they? After extensive weighing of factors and deliberation, Mercury and Jupiter were ascertained to be the two planets paired together without transneptunians. A schema and pattern of distribution then needed to be determined. A diagram (originally rectangular) was formulated that included 9 sections grouped into 3 vertical categories corresponding to C G Jung's introversion-extroversion polarity combined with a third intermediary balancing category referred to as "synthesis". How does one however categorize the schema horizontally? Out of the subconscious ID we build the conscious EGO and also the superconscious SUPEREGO. ID and SUPEREGO both function on an unconscious level; i.e. they often drive us to actions and behaviors which might not be clear to us. The point of investigating this is to attempt to uncover our unconscious behavior patterns. Each sector of the schema contains a related pair of factors, and consideration of those factors was required to determine the most appropriate pairing. In sum, the first (vertical) grouping is composed of the introversion-extroversion polarity balanced by the synthesis category in the center, and then the schema is categorized (horizontally) according to level of consciousness, knowledge of which assists us to control inner impulses by accumulation of understanding and experience. We envision the overall encasement to include 9 sectors. In an original rectangular format, the upper left side contained the extroverted factors expressing conscious energies; and Mars, Uranus and Vulkanus were thought to be placed there. It was difficult to decide about the placement of Zeus and Vulkanus; if Mars and Vulkanus were to function at the subconscious level, they would have lacked the intuitive factor which Uranus and Zeus exhibited at the superconscious level. Therefore, later on, Zeus and Vulkanus were transposed, so that an intuitive factor now operates in both sectors. The Sun, as the source of vitality, emits so much energy that it expresses out to the world as self-confidence and self-assurance. Introversion, originally presented on the right side, corresponds with one's inner life. In dealing with the emotions, the Moon indicates how we feel, and Apollon gives abundance and harmony to what we experience consciously. Then from the ID arise the restraints which Saturn and Admetos manifest as limitations which ultimately and constructively contribute to our inner consolidation. Ideas from the SUPEREGO are thought through in detail as earnestness and depth manifest in the ID. In the polarized sectors we act outwardly, based on the instincts of the moment. In order to relieve the nervous tension of internal and external pressures, a process of synthesis provides the potential for equilibrium. Venus and Cupido are the most effective agents of such energies, thus bringing the emotions into balance. As the classification process neared conclusion, a summary was set forth at a Hamburg School evening seminar in 1984. At that time, there was little receptivity to the rectangular format, and it was suggested that the sectors be presented in a circular format and published in the Hamburger Hefte (III.84, IV.84). Thus was the "Meditation Wheel" born; and it was presented in English in the Uranian Forum in issue 2/85. What is it then that we are setting forth? We must first find a way which can be worked with in connection with the individual natal chart. Through emphasis of individual sectors determined by frequency of factors this is possible; by counting their frequency, we determine the emphases. How do we do this? The Mandala (as illustrated above) can be drawn automatically, printed out, or saved as a computer graphic on the Special Uranian astrology program by Aureas software, designed in cooperation with Ruth Brummund, the designer of the Uranian Mandala. Click here for more information. 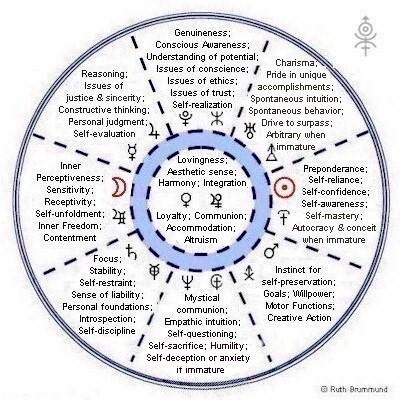 READING THE INDIVIDUAL MANDALA: (Translator's note): Generally speaking, each dot represents an instance where that planet is strongly emphasized, i.e. accounts for over 10% of the midpoint factors on any of the three investigated axes (SU, MA, and ME/JU). By contrast, each ring represents total absence of that planet in one of the three investigated axes, thus indicating a shadow factor. Two or three dots next to a planet represent doubled or tripled emphasis, respectively; and two or three rings indicate doubled or tripled absence/shadow projection. (Note that individual planets in 16th harmonic angle to the 3 given axes are also counted as double, i.e. SU=VE is counted as SU=VE/VE.) Also, when any of the 3 main axes overlap significantly, alternate axes are used for Mandala calculation. Overall, Freudian and Jungian terms are integrated in the fashion of Assagioli's psychosynthesis (similar to the models presented by Louise and Bruno Huber) ; thus this model is not to be interpreted literally according to the orthodox literature of Jungian or Freudian psychology alone, and is more in line with the principles of Transpersonal Psychology. In this schema, the Unconscious includes both elements of the Subconscious or Id, and of the Superconscious or Superego, similar to Assagioli's model. The total number of dots and rings from the consciousness levels and intro-/extroversion sectors can also be applied in the overall assessment. A dot and a ring both at the same planet indicate ambivalence in the given planetary energy, presenting a special evolutionary challenge to the individual for mastery in this lifetime. Note that while planets are paired in sectors, their individual midpoint frequencies are recorded on the Mandala. Ms Brummund has made several modifications to the Mandala since presentations of earlier prototypes and updates, incorporating both her observations and those of her colleagues. The versions you see in the Uranian Beacon / Uranian Institute website reflect current, ongoing communications with Ms Brummund. Translation of abstract concepts such as those used in psychological description can be particularly sensitive, and the English terminology appearing the Beacon Mandalas reflect substantial dialogue with Ms Brummund for the purpose of clarifying the subtleties and how they correlate with both psychological and astrological concepts. Also remember that intellectual and theoretical trends often take slightly different courses on the various continents, and are intermixed locally and interpreted through various cultural and linguistic lenses. The symmetrical axis configurations contain all the factors, and by counting their frequency, we identify the sector emphasis. For character analysis, we refer to 3 major axes: that of the Sun, as vital power; that of Mars for work and activity; and that of the Mercury/Jupiter midpoint as intelligent and fruitful thinking. In cases where any of these axes duplicate one another, we refer to an additional axis. An axis may consist of 18 to 35 midpoints, which would therefore contain 36 to 70 factors. We then subtract the reference points (MC, AS, NO, AR) from the total count, and from the remainder, those points which occur at greater than 10% frequency are noted and plotted on the Mandala with a large dot placed next to the pertinent planet or transneptunian. In early years, the left and right sides were reversed; however at a 1990 seminar it was pointed out that the extroversion factor should appear on the right, just as right-leaning script is considered an indicator of outgoingness by graphologists. While the transposition of the factors in the Mandala was not difficult, we realized that not many people had yet worked with it. Those who do so will find it easy to show the introversion sectors at the left. While in the early stages, only the emphases according to frequency were noted, yet we later began to take note of the absence of factors as being of interpretive value. According to Jungian principles these would be noted as an indicators of the shadow function, thus yielding a more fully-rounded picture in the interpretation. This particular feature needs to be pointed out; absent factors are now marked outside the planetary sectors with a small ring or empty circle. Marking of the dots and rings in the central Venus-Cupido sector was problematic if the number of dots or rings exceeded the capacity of the circle. For this reason it was considered necessary to draw another shaded ring around the central circle, thus also making absences of these key factors more evident when operating as part of the shadow function. Now, as the overall paradigm reaches consummation, we refer to it as the "Mandala", a widely recognized name correlating with our experience. I would encourage each astrologer to become acquainted with the Mandala and therefore learn to appreciate its inherent value. R Brummund: "Carl Gustav Jung and the Mandala"
R Brummund: "Spirituality in the Natal Chart"